There isn't any instruction in the package because using this product is quiet simple. This product is a swing extension spring, which can be connected with porch swing chain or other carabiner even strong rope, to play or just to rest. Choosing our product will be one of your excellent options. QUALITY GUARANTEE-Our porch swing spring, was made of high quality metal, which will be more springy and durable and it don't damage easily. Each end of the swing spring has a rubber tip preventing you from scratching your fingers or hands when you are installing. Per package is a swing spring set, including 2 hammock chair springs which are 8.26 inches in length, 1.57 inches in both width and height. The thickness of the spring(without a rubber tip) is 7 mm. Pleas have a careful look at the picture on the left. WARM TIPS-Weight limit is about 600 lbs. The spring's lifespan will be shortened when it links too heavy things for a long time although it is a heavy duty swing spring. So, we suggest that do not hang some overweight objects with it frequently. 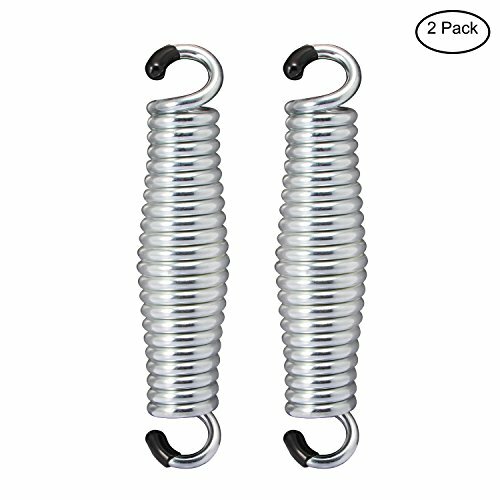 Please make sure the weight capacity and dimension of our swing spring are suitable for your demands before you order our porch swing spring. Our hanging chair spring is a perfect hardware accessory for swing indoors or outdoors on porch swings, hanging chairs and hammocks and so on. It works in a smooth way and can add your enjoyment. SATISFATION GUARANTEE-To ensure you're satisfied with these porch swing springs, we offer a 30 DAYS MONEY BACK GUARANTEE. If our swing spring damaged when you receive, we'll send you a new one at no cost. If you have any questions about this product by FunLavie, contact us by completing and submitting the form below. If you are looking for a specif part number, please include it with your message.